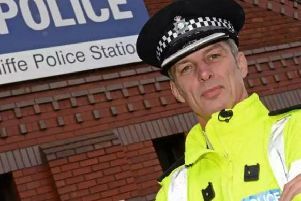 South Yorkshire's new Chief Constable has been urged to try to improve moral among disgruntled police officers. Stephen Watson took over as interim Chief Constable yesterday and officially takes over in November when David Crompton, who is suspended, is due to retire. Mr Crompton was suspended over his handling of the new inquests into the deaths of 96 football fans in the Hillsborough disaster in 1989. He stands accused of going back on an apology the force issued in 2012, when lawyers acting on behalf of South Yorkshire Police during the new inquests repeated discredited slurs on fans in a bid to divert blame from the police. Jurors returned verdicts that the fans were 'unlawfully killed' and that police blunders ‘caused or contributed’ to the disaster. Neil Bowles, chairman of the South Yorkshire Police Federation, said officers were fed up with leave getting cancelled and restrictions being placed on when they can take time off. “As far as our members are concerned the most important item for the new Chief Constable to tackle is officer morale," he said. “Whilst there is little he can do with regards pay and conditions, Mr Watson can certainly get to grips with amount of leave cancellations and embargoes that we have had to endure. Chief Constable Watson is based at South Yorkshire Police headquarters at Carbrook, Sheffield.